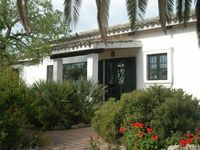 Property 1: Casa Campo de Ana: A rural paradise in the Sierra de Cádiz. Property 8: La Casa Nazari, cottage with wifi and fireplace. A comfortable country house situated in the Natural Park, Sierra de Grazalema. Property 9: A comfortable country house situated in the Natural Park, Sierra de Grazalema. Property 22: Cottage "Casa del Huerto"
Property 36: Sierra de Grazalema, 2-7 people, village center, pool, garden, wifi.